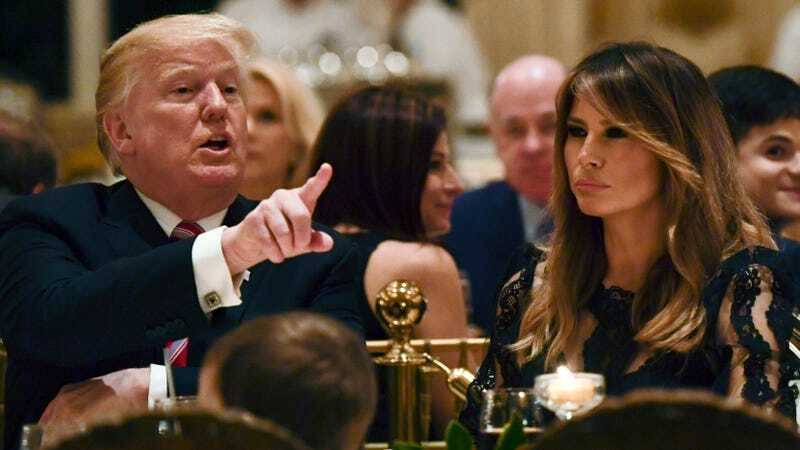 President Trump and First Lady Melania Trump aren’t just making out during lavish dinners at Mar-a-Lago; they’re allegedly having deep, stimulating conversation, too. For hours and hours and hours, in what sounds a lot like punishment. Okay, so they like to be seen. What else can we glean from this? Though she may not eat Trump’s favored blackened steaks and burgers or meatloaf, she keeps her tastes simple and healthy. Melania Trump does, however, oversee menus for bigger family events, including Thanksgiving, Easter and Christmas. But for dinners à deux, the focus is on the conversation, not the cuisine. “Those two will go and sit at dinner, and they are in the most in-depth conversations, and will talk and sit there for hours, literally,” a White House official told CNN, confirming Leamer’s account of the first couple’s habits. But what could they possibly be having in-depth conversations about? Ivanka Trump’s attempted power grabs? Spaghetti? Jared Kushner’s pecs? Donald Trump Jr.’s beard? The options are, truly, endless. Endlessly grim, but endless nevertheless.